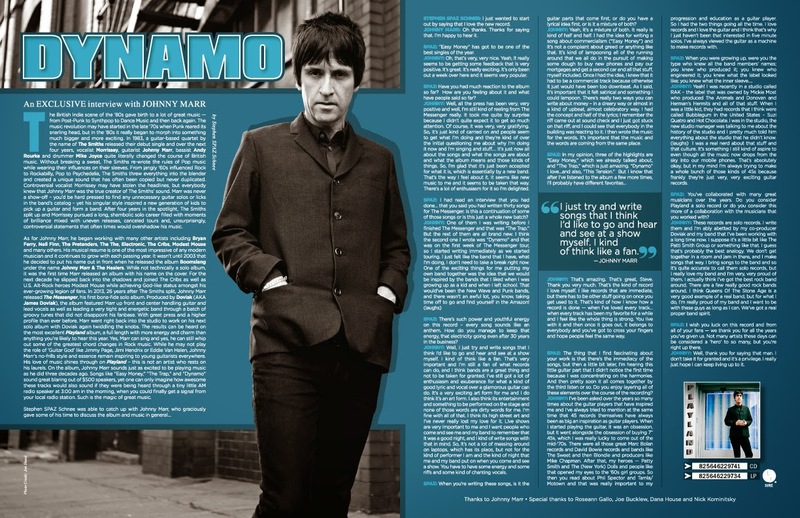 Discussions Magazine Music Blog: An EXCLUSIVE interview with JOHNNY MARR! An EXCLUSIVE interview with JOHNNY MARR! The British Indie scene of the ‘80s gave birth to a lot of great music — from Post-Punk to Synthpop to Dance Music and then back again. The music revolution may have started in the late ‘70s when Punk reared its snarling head, but in the ‘80s it really began to morph into something much bigger and more exciting. In 1983, a guitar-based quartet by the name of The Smiths released their debut single and over the next four years, vocalist Morrissey, guitarist Johnny Marr, bassist Andy Rourke and drummer Mike Joyce quite literally changed the course of British music. Without breaking a sweat, The Smiths re-wrote the rules of Pop music while wearing their influences on their sleeves. From jangly ‘60s influenced Rock to Rockabilly, Pop to Psychedelia, The Smiths threw everything into the blender and created a unique sound that has often been copied but never duplicated. Controversial vocalist Morrissey may have stolen the headlines, but everybody knew that Johnny Marr was the true creator of The Smiths’ sound. Marr was never a show-off – you’d be hard pressed to find any unnecessary guitar solos or licks in the band’s catalog – yet his singular style inspired a new generation of kids to pick up a guitar and form a band. After four years in the spotlight, The Smiths split up and Morrissey pursued a long, shambolic solo career filled with moments of brilliance mixed with uneven releases, canceled tours and, unsurprisingly, controversial statements that often times would overshadow his music. As for Johnny Marr, he began working with many other artists including Bryan Ferry, Neil Finn, The Pretenders, The The, Electronic, The Cribs, Modest Mouse and many others. His musical resume is one of the most impressive of any modern musician and it continues to grow with each passing year. 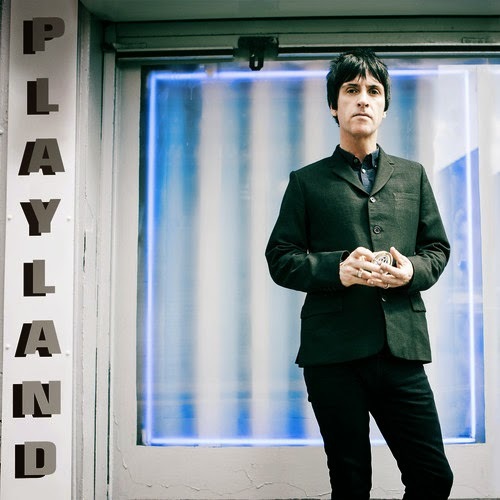 It wasn’t until 2003 that he decided to put his name out in front when he released the album Boomslang under the name Johnny Marr & The Healers. While not technically a solo album, it was the first time Marr released an album with his name on the cover. For the next decade he slipped back into the shadows and joined The Cribs as well as U.S. Alt-Rock heroes Modest Mouse while achieving God-like status amongst his ever-growing legion of fans. In 2013, 26 years after The Smiths split, Johnny Marr released The Messenger, his first bona-fide solo album. Produced by Doviak (AKA James Doviak), the album featured Marr up front and center handling guitar and lead vocals as well as leading a very tight and energetic band through a batch of groovy tunes that did not disappoint his fanbase. With great press and a higher profile than ever before, Marr went right back into the studio to work on his next solo album with Doviak again twiddling the knobs. The results can be heard on the most excellent Playland album, a full length with more energy and charm than anything you’re likely to hear this year. Yes, Marr can sing and yes, he can still whip out some of the greatest chord changes in Rock music. While he may not play the role of ‘Guitar God’ like Jimmy Page, Jimi Hendrix or Eddie Van Halen, Johnny Marr’s no-frills style and essence remain inspiring to young guitarists everywhere. His love of music shines through on Playland – this is not an artist who rests on his laurels. On the album, Johnny Marr sounds just as excited to be playing music as he did three decades ago. Songs like “Easy Money,” “The Trap,” and “Dynamo” sound great blaring out of $500 speakers, yet one can only imagine how awesome these tracks would also sound if they were being heard through a tiny little AM radio speaker at 3:00 am in the morning, when you could finally get a signal from your local radio station. Such is the magic of great music. STEPHEN SPAZ SCHNEE: I just wanted to start out by saying that I love the new record. JOHNNY MARR: Oh thanks. Thanks for saying that. I’m happy to hear it. SPAZ: “Easy Money” has got to be one of the best singles of the year. JOHNNY: Oh, that’s very, very nice. Yeah, it really seems to be getting some feedback that is very positive. It’s great. It’s really exciting. It’s only been out a week over here and it seems very popular. SPAZ: Have you had much reaction to the album so far? How are you feeling about it and what have people said so far? JOHNNY: Well, all the press has been very, very positive and well, I’m still kind of reeling from The Messenger really. It took me quite by surprise because I didn’t quite expect it to get so much attention. Of course, it was very, very gratifying. So, it’s just kind of carried on and people seem to get what I’m doing and they’re kind of over the initial questioning me about why I’m doing it now and I’m singing and stuff…. It’s just now all about the songs and what the songs are about and what the album means and those kinds of things. So, I’m glad that it’s just been accepted for what it is, which is essentially by a new band. That’s the way I feel about it. It seems like new music to me and it seems to be taken that way. There’s a lot of enthusiasm for it so I’m delighted. SPAZ: I had read an interview that you had done… that you said you had written thirty songs for The Messenger. Is this a continuation of some of those songs or is this just a whole new batch? SPAZ: There’s such power and youthful energy on this record – every song sounds like an anthem. How do you manage to keep that energy, that electricity going even after 30 years in the business? JOHNNY: Well, I just try and write songs that I think I’d like to go and hear and see at a show myself. I kind of think like a fan. That’s very important and I’m still a fan of what records can do, and I think bands are a great thing and not to be taken for granted. I’ve still got a lot of enthusiasm and exuberance for what a kind of good lyric and vocal over a glamorous guitar can do. It’s a very exciting art form for me and I do think it’s an art form. I also think its entertainment and something to be performed on the stage and none of those words are dirty words for me. I’m fine with all of that. I think its high street art and I’ve never really lost my love for it. Live shows are very important to me and I want people who come and see me and my band to remember that it was a good night, and I kind of write songs with that in mind. So, it’s not a lot of messing around on laptops, which has its place, but not for the kind of performer I am and the kind of night that me and my band put on when you come and see a show. You have to have some energy and some riffs and some kind of chanting vocals. SPAZ: When you’re writing these songs, is it the guitar parts that come first, or do you have a lyrical idea first, or is it a mixture of both? JOHNNY: Yeah, it’s a mixture of both. It really is kind of half and half. I had the idea for writing a song about commercialism (“Easy Money”) and it’s not a complaint about greed or anything like that. It’s kind of lampooning all of the running around that we all do in the pursuit of making some dough to buy new phones and pay our mortgages and get a second car and all that stuff, myself included. Once I had the idea, I knew that it had to be a commercial track because otherwise it just would have been too downbeat. As I said, it’s important that it felt satirical and something I could lampoon. There’s really two ways you can write about money – in a dreary way or almost in a kind of upbeat, almost celebratory way. I had the concept and half of the lyrics; I remember the riff came out at sound check and I just got stuck on that riff, and I could see that everybody in the building was reacting to it. I then wrote the music for the words. It’s important that the music and the words are coming from the same place. JOHNNY: That’s amazing. That’s great, Steve. Thank you very much. That’s the kind of record I love myself. I like records that are immediate, but there has to be other stuff going on once you get used to it. That’s kind of how I know how a record is done — when I’ve loved every track… when every track has been my favorite for a while and I feel like the whole thing is strong. You live with it and then once it goes out, it belongs to everybody and you’ve got to cross your fingers and hope people feel the same way. SPAZ: The thing that I find fascinating about your work is that there’s the immediacy of the songs, but then a little bit later, I’m hearing this little guitar part that I didn’t notice the first time because I was concentrating on the harmonies. And then pretty soon it all comes together by the third listen or so. Do you enjoy layering all of these elements over the course of the recording? JOHNNY: I’ve been asked over the years so many times about the guitar players that have inspired me and I’ve always tried to mention at the same time that 45 records themselves have always been as big an inspiration as guitar players. When I started playing the guitar, it was an obsession, but it went alongside the obsession of buying 7” 45s, which I was really lucky to come out of the mid-‘70s. There were all those great Marc Bolan records and David Bowie records and bands like The Sweet and then Blondie and producers like Mike Chapman. After that, my heroes — Patty Smith and The (New York) Dolls and people like that opened my eyes to the ‘60s girl groups. So then you read about Phil Spector and Tamla/Motown and that was really important to my progression and education as a guitar player. So I had the two things going all the time. I love records and I love the guitar and I think that’s why I just haven’t been that interested in five minute solos. I’ve always viewed the guitar as a machine to make records with. SPAZ: When you were growing up, were you the type who knew all the band members’ names; you knew who produced it; you knew who engineered it; you knew what the label looked like; you knew what the inner sleeve…. JOHNNY: Yeah! I was recently in a studio called RAK – the label that was owned by Mickie Most who produced The Animals and Donovan and Herman’s Hermits and all of that stuff. When I was a little kid, they had records that I think were called Bubblegum in the United States – Suzi Quatro and Hot Chocolate. I was in the studio, the new studio manager was talking to me about the history of the studio and I pretty much told him everything about the studio that he didn’t know. (laughs) I was a real nerd about that stuff and that culture. It’s something I still kind of aspire to even though all the music now drops from the sky into our mobile phones. That’s absolutely okay, but in my mind I’m always trying to make a whole bunch of those kinds of 45s because frankly they’re just very, very exciting guitar records. SPAZ: You’ve collaborated with many great musicians over the years. Do you consider Playland a solo record or do you consider this more of a collaboration with the musicians that you worked with? JOHNNY: These records are solo records. I write them and I’m ably abetted by my co-producer Doviak and my band that I’ve been working with a long time now. I suppose it’s a little bit like The Patti Smith Group or something like that. I guess that’s probably the best analogy. We don’t get together in a room and jam in there, and I make songs that way. I bring songs to the band and so it’s quite accurate to call them solo records, but I really love my band and I’m very, very proud of them. I actually think I’ve got the best rock band around. There are a few really good rock bands around. I think Queens Of The Stone Age is a very good example of a real band, but for what I do, I’m really proud of my band and I want to be with these guys as long as I can. We’ve got a real proper band spirit. SPAZ: I wish you luck on this record and from all of your fans — we thank you for all the years you’ve given us. Not many artists these days can be considered a ‘hero’ to so many, but you’re right up there. JOHNNY: Well, thank you for saying that man. I don’t take it for granted and it’s a privilege. I really just hope I can keep living up to it.